She was just too beautiful for words. Her white gown wasn’t made of silk or gold but the sparkle on her face made it glow like precious gems. Clearly written all over her face, it was the happiest day in her life. No doubt about that. The joy of tidal waves lapping every breath she took. It was marvelous. Although I wasn’t the one walking the aisle along her, I am most fortunate to share that special moment. 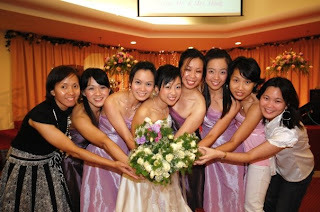 The maid of honor and the other 3 bridesmaids looked so stunning in the lavender coverings. Bold but yet subtle touch, accented their fair and dark complexion of each girls in pride. Each of the flower girls gingerly holding a little basket filled with white roses petals marched into the chapel as if going before an emperor to present a gift. A momentarily paused came, she walked in with the brightest smile ever, hands clutched tightly to her dear father. My eyes glistened and speech left me. Soon, I realised drops of heavy liquid starting rolling off my cheeks. Never did I expect to feel such phenomenal emotions. The ceremony was really sweet. The pastor made a speech, not a boring one, I must admit. Honestly I was afraid I might doze off during the talk. Luckily, the words were so inspiring and enlightening, I stayed awake. Soon after the exchange of vows and the formal signing of marriage certificate, the girls celebrated every moment of it. We took photos of ourselves in every angle possible. The photographer seem pleased with his chore as he smiled in glee at each pose we did. I counted softly in my heart, I think we must have taken nearly 50 shots. Honestly, who could blame us, friends united after more than a decade. I truly enjoyed the reunion and that special day. May God bless the newly weds. Can friendship be rekindled ? The last time I saw them was 12 years ago. If it wasn’t for that day, we would never cross path again. Time has been very kind, for they looked exactly the same the day I bid them farewell. That very moment on that special day, we gathered and laughed like teens, just as we often do, just like we’ve never been apart. Then, we say our last words to each other, and never be heard again until the next special day came again. I am not sure if that bond is call friendship. One, that can be absent in your life for more than a decade and the light reappears just like that. Just when I have bleak hope, when darkness falls, the Almighty sends me small reminders that the light can be reignited. Just a spark and oxygen in the air will do the rest. This post is dedicated to the light in my life, my dear friends. For only you, took notice of my absence, a friend who remembered me as a friend.